Samson in the 24th 1/2 Century? 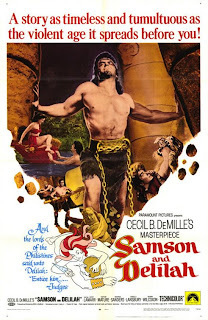 Variety reports that Warner Bros. is planning a futuristic retelling of the story of Samson & Delilah. The full article can be read here. I have mentioned before that I enjoy looking at the gospel and the stories of the Bible from different perspectives because it causes you to take a fresh look at things you might be taking for granted. So in some regards this project intrigues me. It has a strong director, Francis Lawrence (I am Legend), and a good writer, Scott Silver (8 Mile, X-Men:Origins), so as a movie it likely won’t be a complete disaster. The question is; how well will the original point of the story come across? Or if you like; how much will the sub-plots created to support the Sci-Fi environment get in the way? Biblical movies, or movies inspired by Biblical stories are usually a mixed blessing. As I said, while they can provide a fresh vision of the story allowing us to rethink some of our preconceived notions, they can also, and this happens a lot, get so caught up in the subplots design to make a “better story” out of it that the real purpose of the tale is lost in translation. Cecil B. DeMille’s ‘Ten Commandments‘ is a good example. So much time is spent on the love triangle story involving Moses (Charlton Heston) and the Egyptian princess Nefretiri (Anne Baxter) and Rameses (Yul Brynner) that the 40 years wandering in the desert is reduced to a single line of dialog in the last moments of the film. Despite this drawback however, I must give DeMille his due. He doesn’t mess with the basic Biblical story, he either had to much respect for the Scriptures to do that or he knew he’d have the combined wrath of Christian and Jewish clergy to deal with if he did. He did however, love to embellish the story with as much extra material as he could get away with; after all, nothing sells a movie like a good love triangle. He did the same thing seven years earlier when he made ‘Samson and Delilah‘ starring Victor Mature and Hedy Lemarr. It’s done in true DeMille style, great costumes, lavish sets, lots of special effects, and excellent casting. Though to be fair Mature was not his first choice, but Burt Lancaster and Steve Reeves both turned the part down. Even so, it still stands today as the most watched cinematic treatment of the story. Over all Demille did a great job of telling the stories of the Bible in ways that captured peoples imaginations and, more often than not, respected the integrity of the Biblical narrative. And I think that is why they succeeded as well as they did. Yes, all star casts and lots of pomp and slendor helped, but respect for the story itself I think is the most important aspect of his approach. When you look at his additions to the narrative most of them are completely in keeping with the times and do not contradict the biblical narrative. Just because the Bible doesn’t mention a romantic connect for Moses in Egypt doesn’t mean he was celebate, it just means it didn’t affect the story God wanted in the scriptures. There is one other movie version of the story from the book of Judges that I know about but haven’t seen as of yet. Part of a late 1990s Bible Movie Collection produced in Germany (which also contains films about Moses, Abraham and Jeremiah) it starred Eric Thall and Elizabeth Hurley as Samson and Delilah (respectively – wouldn’t want any confusion. lol). From the reviews I’ve read it appears to do a more than reasonable job of presenting the Biblical story with culturally accurate additions to fill out the three hours of film. I’m told it takes a few shortcuts on the special effects, but I guess they didn’t have DeMille’s budget. It sounds like one I’d like to see and add to my collection. On a purely movie fan note, another reason I want to see this film is it also contains performances by Dennis Hopper and Diana Rigg. A sci-fi version of the Samson story could indeed provide some insights, especially if Lawrence and Silver protect the integrity of the Biblical narrative. And this doesn’t mean that Samson has to spout dialog straight from the book of Judges, I’ll be happy if he acknowledges the source of his power is God, or at least a higher power outside of himself. I guess we’ll just have to wait and see. In the meantime, if any of you know of other worthwhile examples of how to do a biblical movie right I’d love to hear about it. Drop me a line in the comments section. Likewise ,if you know of a classic example of just how bad it can get drop me a line in the comments about that as well. How far we have come… or have we?